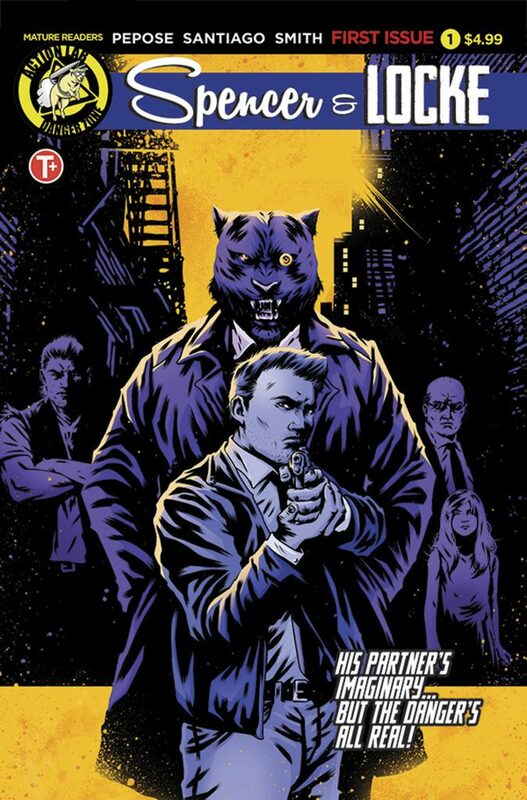 Spencer and Locke are detectives working the beat in a seedy side of town. The town is full of crime and debauchery, plenty of stuff to keep them busy. Night by night, they patrol the streets, finding bad guys, investigating murders, and ridding the streets of crime. They are a crime solving duo, the best of friends. Spencer is the brains. Locke is the muscle. Spencer is an imaginary, talking panther. Locke is a human who carries a stuffed panther around, one he’s had since childhood. “Spencer & Locke” is Calvin and Hobbes all grown up. It takes the familiar formula, a boy and his imaginary best friend, and turns it into something a bit unexpected. The story takes place in modern day, when an old flame of Locke’s is found murdered, and he must solve the case. Through flashbacks we see Locke’s childhood, which gives us a glimpse into his tortured past. From an abusive mother to getting beat by the neighborhood kids, growing up wasn’t easy, but was made easier by his best friend Spencer. Writer David Pepose and the rest of the crew behind this title are, without a doubt, fans of the books by Bill Watterson. The flashbacks look and feel like vintage ‘Calvin and Hobbes’, everything from the artwork, all the way down to the lettering. Everything else feels great also. Most of the story is told through narration by Locke, which sometimes comes off as a cliché, but never detracts from the overall story. As a whole it flows well, cutting between the modern day and flashbacks seamlessly. If you’re looking for something to read that is familiar, but feels like something completely different, “Spencer & Locke” is for you.